Embark on a Frozen Themed journey with your friends and family using this all-inclusive Frozen Themed Party Pack for 16 guests. 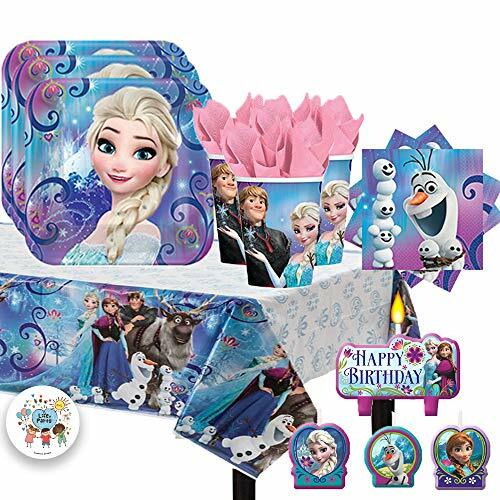 Inspired by Frozen's Anna, Kristoff, Elsa, and Olaf, our party pack is designed with your child in mind and contains 16 emblematic Frozen themed plates, 16 Frozen themed cups, 16 Frozen themed napkins, 4 Frozen themed Birthday candles, and a Frozen themed table cover. All the essential components of a Frozen themed get together are in this pack! Another Dream is also pleased to add an EXCLUSIVE "Life of Party" 2.5" Button which can be used as an activity prize or gifted to a special guest or the host themselves with this essential party pack! Cup Specifics: 9 oz Plate Specifics: 9" Square Plate Table Cover Specifics: 54" x 96"
Plus an EXCLUSIVE "Life of Party" 2.5" Button which can be used as an activity prize or gifted to a special guest or the host themselves! Another Dream L.O.L Surprise Birthday Party Pack for 16 with Plates, Napkins, Cups, Tablecover, and Candles!